We all know the importance of being an equal opportunity employer in today's society. 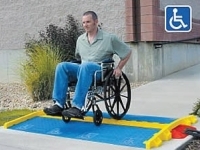 Using ADA compliant wire and cord ramps will help you be sure that everyones needs are considered. 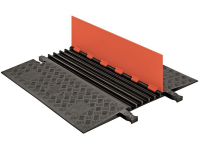 These options offer exceptional protection for valuable wires, cables and hoses while adhering to the strictest government standards as it pertains to accessibility. 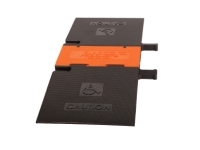 We offer various types and designs of ADA compliant Protectors designed to not only protect valuable cables, hoses and wires but to also provide easy wheel chair accessibility. 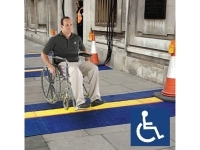 Protectors can withstand heavy vehicular traffic as well as pedestrian traffic. 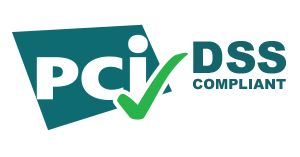 Ideal for use in the entertainment and events industries as well as other applications where governmental standards require that cables are protected with ADA compliant protectors. Made in the USA.